Like computing, 3D printing has been around for decades but it was expensive and was only used for making complex prototypes. Now, prices have dropped and third-party printing services such as Shapeways have become available, making the technology available to everyone. This practical guide gives Blender users all the information they need to design high-quality 3D printed objects. With a solid exploration of the 3D modeling process, design considerations for 3D printing, plus step-by-step exercises, you will soon be comfortable making 3D objects for real-world enjoyment. Starting with an overview of 3D printing, this guide moves onto to precision measurement, fixing problems in a 3D model, and how to make it light and strong enough for real-world use. You will learn how to scale, build, and detail a model for a 3D printer. You will learn to color and decorate it, as well as making parts precisely in the size you want them, so that multi-part objects fit together smoothly. You will also learn tips on saving money when you have printed your model. With the help of this guide, you will be able to complete your project and learn how to export the file so it is ready for a variety of 3D printers. This book adopts a practical approach, with the use of step-by-step instructions to help guide readers. There are lots of screenshots covering each and every step needed to design a high-quality model in Blender for 3D printing. If you are a Blender user or someone who wants to use Blender to make 3D objects suitable for 3D printing, this book is ideal for you. You should already be comfortable with basic modeling in Blender – including using modifiers – although advanced skills are not required. All of the models that you will need are explored in-depth. 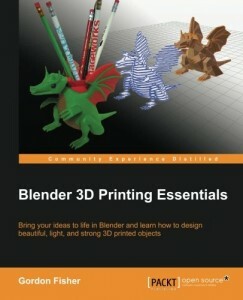 This book does not assume that you will use any specific printer and teaches the general principles common to building models for most printers. It also gives you tips on discovering the requirements of the specific printer you will be using.